Aside from "Laglag Bala syndicate" in Ninoy Aquino International Airport (NAIA) that victimizing Overseas Filipino Workers (OFW), tourist or even dignitaries another problem that is still persisting is the baggage theft. After the latest incident where four baggage handlers in NAIA are arrested for allegedly stealing the jewelry of the wife of Turkish Foreign Minister Mevlut Cavusoglu, Senate President Pro-Tempore Ralph Recto believes that there is syndicate in NAIA involving its personnel in stealing from bags of passengers, especially OFWs. With this, Recto said, the government should arrest the leaders and destroy this syndicate. 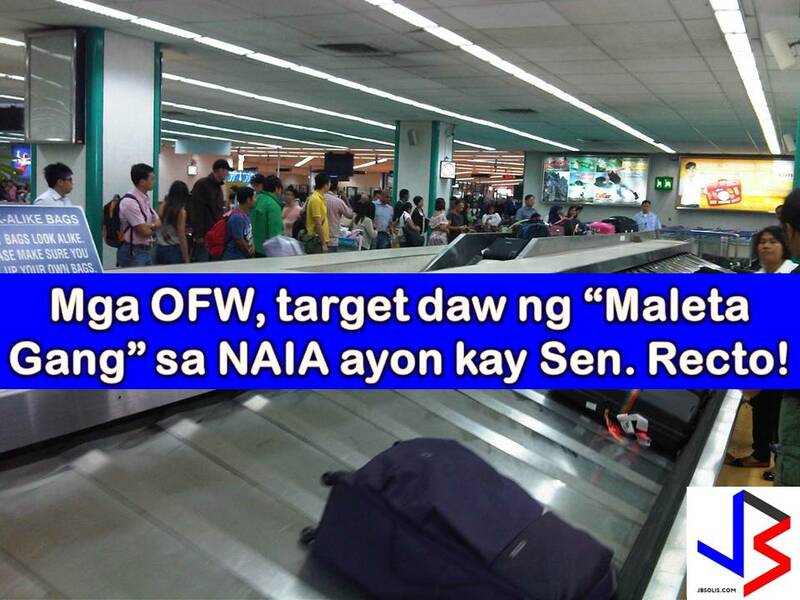 The senator believes that Philippines will be spared from embarrassing incident if authorities had to stop these shameful activities in NAIA. He is urging the National Bureau of Investigation and other non-NAIA based agencies to conduct an investigation and spearhead the arrest of the suspects. 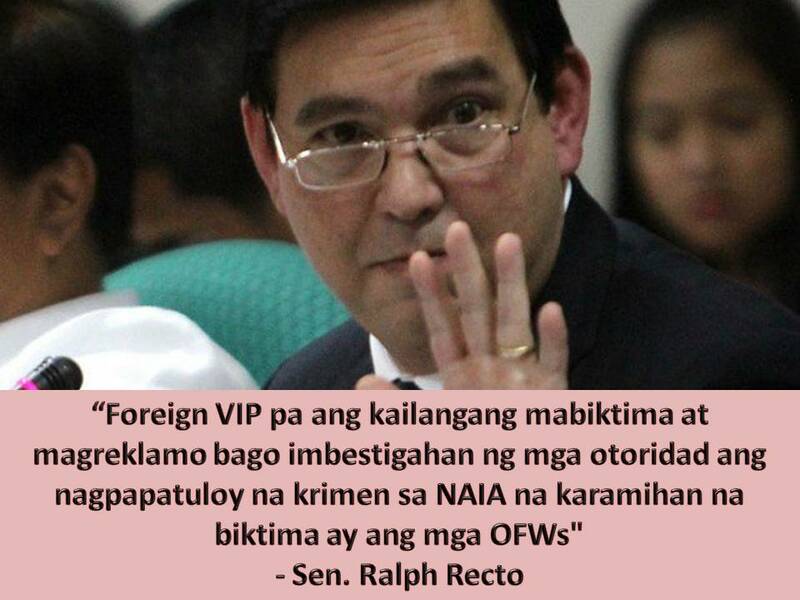 “When you steal from OFWs, they who are returning from long and low-paying hard labor abroad, then you are an enemy of the state,” Recto said. Recto added this crime only add up to a negative connotation with NAIA as one of the worst airports in the world in terms of passengers facilities. “You are paying airport security fee, and then your things are not secured. So what’s the use of paying for your security and the security of your things,” added Recto. 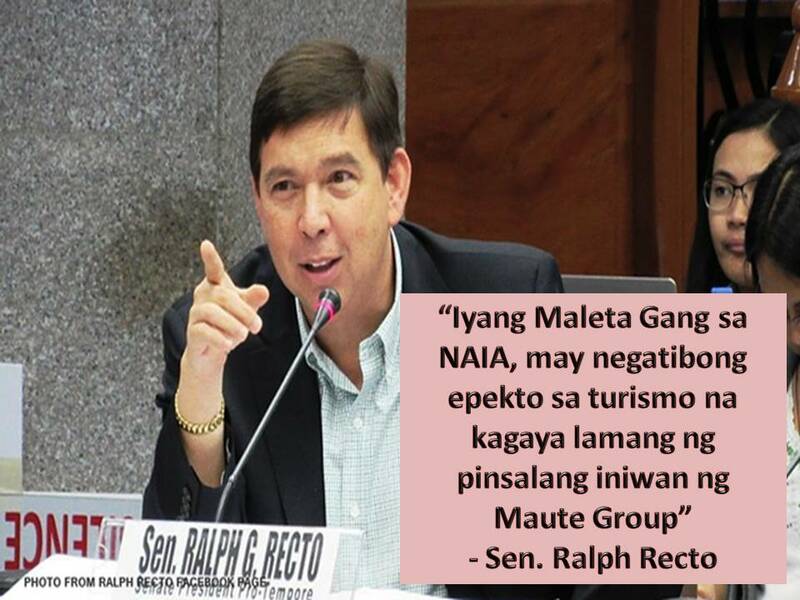 With this, Recto said, a serious airport clean-up drive is needed, not only in NAIA but also in all airports in the Philippines. Only this month when Recto instructed airport security to investigate the alleged new case of "Laglag Bala" in NAIA where according to report, a Korean student is a new victim.